Our Yorkshire roofing management team has over 20 years experience in the new housing, with roofing contracts for Leeds Commercial Roofing, York Commercial Roofing and Wakefield Commercial Roofing. 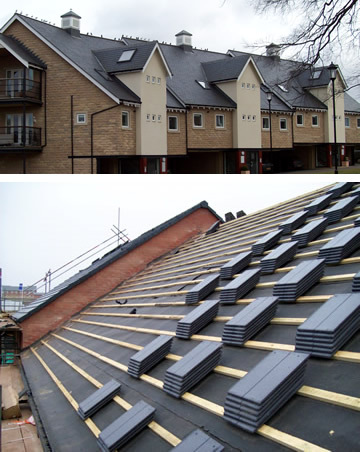 We have close links with all the major roofing manufacturers and suppliers and are able to offer technical advice and budget costings for a wide range of commercial roofing products. Every member of our Leeds commercial roofing team, York commercial roofing team and Wakefield commercial roofing team of roof tilers and fibreglass flat roof experts is based in Yorkshire and are City & Guilds or NVQ qualified. They all hold CSCS (Construction Skills Certification Scheme) cards and are fully experienced in site work. Additionally, all our Yorkshire roof tilers undergo regular Health & Safety training and operate within or Company Health and Safety Policy, Risk Assessments and Method Statement. We carry out all work to current NHBC/Zurich/British Standards and provide a manufacturer's tile fixing specification for all contracts. Our dedicated site management team ensure that all contracts are completed in line with clients' build programmes and specifications and that the workmanship is of the highest standard.